Featuring a centered steel wire, coated to resist rust and encased in vibrant red and white striped laminated paper, these Bedford Industries Inc. 4" twist ties provide strong gripping power, ideal for closing, twisting, and bundling products. 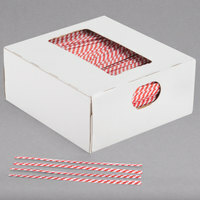 When used in conjunction with additional colors (sold separately), these twist ties serve as a valuable asset to inventory management, indicating which day of the week your items were packaged. Use them to secure bread, pastries, cookies, or candies, chips, pretzels, and so much more - the bold color ensures that your staff keeps only the freshest stock on the shelves! These twist ties are a perfect complement to our candy bags. We love the red and white stripes. They close easily and look nice with the bags we use! Twist ties are a very simple item, so there is not much to say. I ordered these as I was closing a candy cane item, so the color worked perfect for my theme! The box was a little hard to get them out. I would end up taking a stack out and setting them down to use, so would prefer a little wider opening. Bought these to close some some candy bags I purchased in my last order. They come packaged in a nice white box with an opening that makes it easy to get a few out at a time and small enough to take no space to store. There really isn't much that can go wrong with this item, but they are well made and the red/white stripe of the paper would go well with any venue or holiday. These twist ties are not only attractive but so durable. All that and at a great price too. Who could ask for more than that? These twist ties are a great colorful accent when packaging baked goods for sale. The variety of colors available makes them both fun and decorative. These twist ties come in very handy in the shop. I use them to color code my cake pops so the customers know which flavor is inside the pop. Great quality twist ties, they're all perfectly straight. I use them for bread bags, way better than trying to tie the bag.. spend the money and get these! These are a super nice touch to tying up novelties and candies. Look great and add to the aesthetic appeal of the items. Perfect length for tying off bags. These twist ties are used to seal up my muffins in the clear bags and work perfectly, The stripes are a cute color to add as well! These Laminated Bag Twist Ties are amazing! We use these ties to secure our clear bags (chips, cookies, and candies) and to easily identify flavors. These are a nostalgic twist on a traditional twist tie- we use these to seal up the bags on our freshly baked muffins. They make something simple look a little nicer and more professional. Great twist ties, everything you would expect them to be. They aren't super fancy but are durable and work well for closing up piping bags, or twisting bags of cookies closed etc. We use these in our farm stand to tie off bags of apples, pears and fresh vegetables. The box they come in is useful for retail and I like the cheery red and white color. Great twist ties at the best possible price! These are exactly as a twist tie should be and are a great quality! The variety of colors comes in handy to color code for dates, etc. Bedford industries inc. 4" red striped laminated bag twists ties. A box of 2000 ties. Great way to keep in the freshness! Glad I was able to get these here! This is the best price I have found anywhere for twist ties! My employees think the striping is fun and different instead of a solid color. These twist ties are perfect for my use. I am a kettle corn vendor and twist tie thousands of bags per year. They are strong and easy to handle. The price is perfect for 2000. I would definitely order these again. These twist ties are great. At the bakery we just them to tie up our rolls, pretzels and buns in the plastic bags. The packaging is also nice and convenient. The Bedford Industries Inc. 4" Red Stripe Laminated Bag Twist Ties are very nice to have in our home. I like to make treats and use them on the bags, I really like the appearance. Its also nice to have for a replacement since we seem to lose them often. I definitely recommend this product. These twist ties are nice and long and they come in a multiple of different colors is a nice option when using on different products. This is a cool product! This red laminated twist ties are great for candy bags. The ties twist smoothly without ripping. The laminate covers the wire all the way through so you don't have any wire tips sticking out. These twist ties save me a ton for time when packaging cake pops. I use to tie them closed with ribbon but that was such a pain. Not anymore! We use this product in our French bakery to close our plastic bread bags. Ties are solid, our customers can open and close the bag as many time as they want. The color is nice. Item was shipped and handled in a very timely manner and we couldn't have expected any more. Item is just as described and no surprises. We use these ties to hold up some pretty hefty things in our process and they are up to the task. We even get a few uses out of them before sending them to the bin. These Twist ties are a great price and better quality than other twist ties ordered else where. Why pay more for some thing you will throw away anyhow? I love these twist ties! They are much stronger than I expected and they look great with our Inteplast Group PB050418 5" x 4" x 18" Plastic Bread Bags. I tried the red and white twist ties. I like that the color did not come off on my hands. I used them at Christmas and they can be used for valentines too! The Bedford Industries Inc. 4" Red Stripe Laminated Bag Twist Ties worked great for sealing my 4x2x12 bags full of wet naps. I simply filled the bag with the wet naps and the twist ties created the perfect seal. As a large production bakery, we go through thousands of twist ties weekly, and these have been great. They twist tightly and stay closed. We've never had any issues with them breaking either. I am very happy with my purchase. You can used them to tie candy bags. The colors are vivid, good quantity and the price is great. I do recommend this product.